I wasn't into football when I was young and we were living in Kano, Nigeria - I just remember running around playing with bicycle wheels. We'd go to the school that my Grandma cooked for, playing round the back near the kitchen and getting free food. We came to London when I was six, in the early 1990s. My sister was getting treatment for cancer, and she died here. There were a lot of bad things going on back home so we came over to England. I was lost when I first came to London! My brother Michael and I stuck together. It was difficult for people to accept us because we looked different and spoke differently, but boys will be boys and football is a universal language. We eventually got into the swing of things in a couple of years. I wasn't interested in football until I was 15 or 16. I loved athletics and represented Great Britain at one stage in the triple jump and long jump. I used to play for the same team as former Manchester City and England midfielder Shaun Wright-Phillips but I never used to go to training - I used to turn up on a Sunday with my boots and some fast food in my hand and ask for a game. Because I hadn't been to training they would often say no. But sometimes there was a player short and I'd get a game - that's how seriously I took it. One day a scout for Manchester City was there and asked me to go to the club. I told my Mum I wasn't interested in football - going to Manchester was like going to Spain! I'd never even been on a motorway. I said no but they came back and asked again. At the time there were a lot of negative things happening in Peckham, a lot of crime, a lot of murders. A lot of people in my area were involved in crime and my Mum didn't like us being around that. She said, "You've got the opportunity to go away for two weeks on trial, go and enjoy it, if you don’t enjoy it come back." I said, "I'll go for you Mum," and I never came back - I signed a three-year contract. George Weah was one of my idols. He was a great man. I played with him at Manchester City. Me and Shaun used to go to his house for dinner at the weekends and his wife would cook for us. I'll never forget the day he left. It was very emotional - me and Shaun had spent so much time with him, he took us under his wing and he looked after us. He said to us, "I'm leaving so come round my house and take whatever you want." We were taking microwaves, televisions, even socks because we had nothing, and stuck it all in our little car. In terms of my Nigerian idols there's Kanu, Jay-Jay Okocha - a great, great player - and Stephen Keshi, the current national manager, probably the greatest captain Nigeria ever had. He's a great man. I'd heard so much about him as a person and never got to meet him until now, but he's got an aura about him. When he says something you trust him - and you can’t get that from many people. 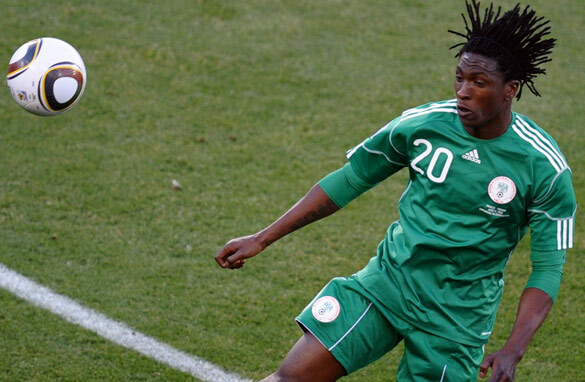 Playing for Nigeria was one of the greatest moments of my career. My first game was Mexico away, which was a shame, had it been at home it would have been even more special. I had dreamt about wearing that shirt. I saw a lot of my idols playing for Nigeria and now I thought I've got an opportunity to wear the shirt; 250 million people in the country and I'm one of just 11 wearing the shirt. Nigeria's my home. When I go there I feel connected. It's the best place in the world for me. There is poverty, yes, but you can see people who are not interested in material stuff, they just want to be with their family. I'm going to go back to Nigeria to live when I finish playing. I've got a lot of unfinished business there. I want to have a charity in Nigeria and one in England as well, because growing up in Peckham I go back and see kids like me who need that little opportunity to make something better for themselves and I want to be able to give them that. It's something that drives me. Most of the coaches in the Nigeria leagues especially need to come to Europe and get some experience and do their badges - that will help African football. That's the difference, when you watch the World Cup you can see the difference is the knowledge of football, not so much technical or football, it's to do with knowledge, when to do what with the ball. When we get that I think Africa will go on and dominate world football. a terrific story – I wish Dickson Etuhu every success with club and country. Never forget your roots and what you can do to help monetarily if you can. Just your presence there in your old community will make others strive to do better. Nice one Dickson, but when you return please don't go to Kano. A true champion! A man with The ATTITUDE OF GRATITUDE! Now this what I call a man with a lot of Class. May your path in life be full of Good things. Never forget where you come from. I wish you can educate the rest of Nigerian Players that think they have arrived, whenever they move to europe, and don't want to go back to their country and play with all their heart. More happiness is in your future path. Why are you focusing on african players. Which footballers here in England or europe were born with a silver spoon? One can equally look at it as african players enriching the game here that had otherwise become boring. Any way they are all making the same journey from rags to riches. Focusing on africans is fuelling racism with people calling african players gold diggers. CNN please leave african players alone. Its at moments like this that my faith in my country Nigeria is reaffirmed. Thanks Dickson Etuhu for today you gave me faith and thought me humility. Dickson connects to the root unlike others who pretend to be a stranger in their own country. Keep it up young man, you rock! The mindset of a true son of the soil. Bravo Etuhu. Like Kanu who has given HEART to over 300 children, you have also toed the right path. Only have the will of a Stallion to allow your passion for homeland crystallize into action, only then, like Kanu, would you have left indelible footprint on the sands of time. bravo bro! these few words from you is great inspiration to us back home who are a little despondent about the prospects of Nigeria as Nation. Great story, if you ask me, very inspiring to any one who thinks making it to the top is only possible when one is from a rich family. Greatness awaits those who dare to venture, doesn't matter what family background you come from. There is always someone out there who will discover the talent in you and will give you a chance to florish in life. All the best wishes! God will see you through, let your life affect the people around you,. Bravo! Your story is one of many untold story by Nigerians in different works of life Nothing but love patriot. Keep the fire burning. Great story. True humbleness. We need more stories like this. Nevertheless, no hard feelings, but I am simply curious why he has been getting a lot of CNN spots of late. Any explanations? go back but do not use your credit cards in negeria. Nigeria is a waste of time. It's a dead nation. Once you make it you need to change your nationality like many of us – you'll find out soon, Dickinson. GREAT GUY!....REALLY WISH ALL OTHER SPORTS PEOPLE COULD BORROW A LEAF FROM THIS GUY.....DOWN-TO-EARTH. GOD WILL SEE YOU THROUGH. You are making we Nigerians Proud. Keep the ,moving. don't give up. God will strengthen and protect you. You have always been a nice guy, this is nt the first time dat you hv spoken ur mind, All nigerians loves you, thnx for appreciating ur national color. God bless you. Inspiring. Fantastic stuff. Wishing Dickson all the very best in his people-oriented projects and in life. Nigeria a nation of 160 million people, just needs 2000 commited heart like these, than we 'll be fine. I wish you more blessing brother. go ahead, play the round leather game it's in u, posterity will tale of you, make us proud pls. Inspiring journey to success.Wishing you more success in your football career. England yes. they have that nack to beat racism, bring in the black pple in the sphere of things. But African brothers in this land down under are suffering the worse racism than you can imagine. HE HAS POTRAY A WINNER.S ATTRIBUTE.TRUELY YOU ARE A FOCUSED WINNER. BROS YOU ARE A GOOD SEED,PLAN AHEAD YOU WILL GO PLACES,CHEERS BRO. Great guy! I wish other Nigerian Footballers and sports personalities generally could learn from you. Keep your head up and continue with your good work. whenever Dickson speaks i have so much respect for him because he genuinely has a good heart. I just looked at the world soccer rankings for Nigeria and at number 56 or so in the world it is the sad. A great soccer nation with a lot of talent at that position puts tears down my cheeks. At the current level its unfortunate this will correct itself in 12 years or so. get them into duecation and higer duecation and that will be thier success for life! thats defiantely 1 heck of a money making project that will be rewarding and successful and then they can be teachers and help others and pass down knowledge etc and work too. also, stop cheap labour. they are humans just as much as every other human in the world. no1 is superior than the other. not even the kings, queens and presidents! keep it on guy your word is what dreaming of, we're proud of that.